Lagos State is set to host the maiden edition of the Nigeria Beer Festival, which runs from September 25 to October 1, and the weeklong event will climax with an Independence Day mega concert. 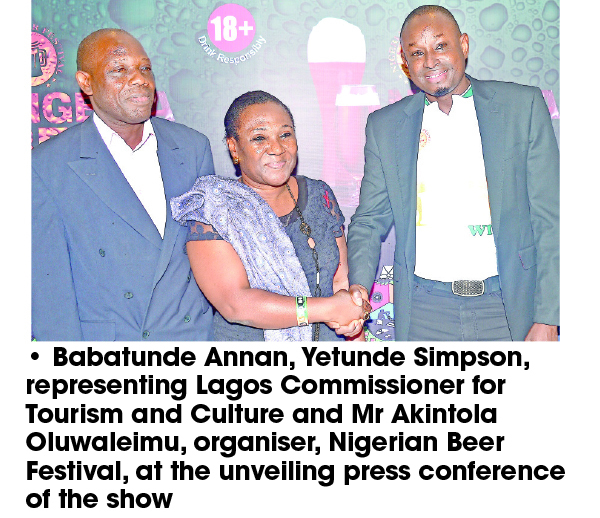 Speaking, Akinola Oluwaleimu, GM, One & One Events Limited, revealed that the festival will hold at Lagos Atlantic City and it would place Nigeria in the league of hosts of beer festivals around the world, while also boosting the country’s tourism opportunities. He added that the festival would provide a fitting ambience to showcase fashion and lifestyle with brands connecting with consumers. Also speaking, Babatunde Annan, an official of the Lagos State Ministry of Tourism, explained that government is collaborating with beer brewers across the globe to stimulate the economic and tourism potentials in the state. He revealed that Governor Akinwunmi Ambode would grace the closing ceremony.